Under Armour isn’t messing around: they’ve come back to the running game and they’re taking shoes very seriously. The Infinite is the newest shoe added to their 2019 lineup. It’s a neutral cushioned trainer, designed for long distance running. This shoe has a firm ride, mild drop and responsive cushioning. It’s a distance shoe that performs like a speed flat, making it essentially the ideal long-run shoe. I used this shoe during long runs and tempo workouts, and it was fantastic for both. The shoe is a little bulkier than a flat, so you’re protected during your longer workouts, but has the response of a speed shoe so you can get the most out of your run. The shoe is also fairly priced. At only $150 CDN and with a built-in chip to track your runs and progress, the shoe eliminates the need for a GPS watch on your run. This is a cost savings to the runner without compromising on data or training insights. And if you’re not into the numbers of running, you can just forget the chip is there–you won’t notice it at all while you’re working out. HOVR Infinite. Photo: Under Armour. The upper features a plush collar and a gender-specific moulded sock liner. The collar ensure no cutting or digging in the ankle area, while the sock liner cradles the foot based on a runner’s anatomy. The shoe comes in two colourways–pink and orange in women’s sizes and green and orange in men’s. The midsole features a charged foam topsole on top of the HOVR midsole. This charged foam is what gives the shoe its spring by controlling the HOVR and harnessing its energy return to propel the runner forward. HOVR is Under Armour’s newest foam and it’s used through the entire Infinite midsole. The outsole is where lots of companies skimp on cost. But Under Armour didn’t, using blown rubber, combined with carbon rubber at the back of the shoe for high-impact landing zones. The traction on these shoes is great, and they had no problem handling a sloppy trail or slippery sidewalk. RELATED: What is Under Armour HOVR? 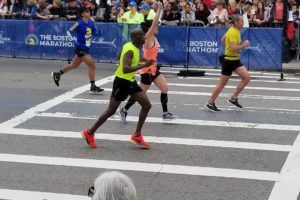 The company has updated its connected shoe experience, bringing runners instant data collection. 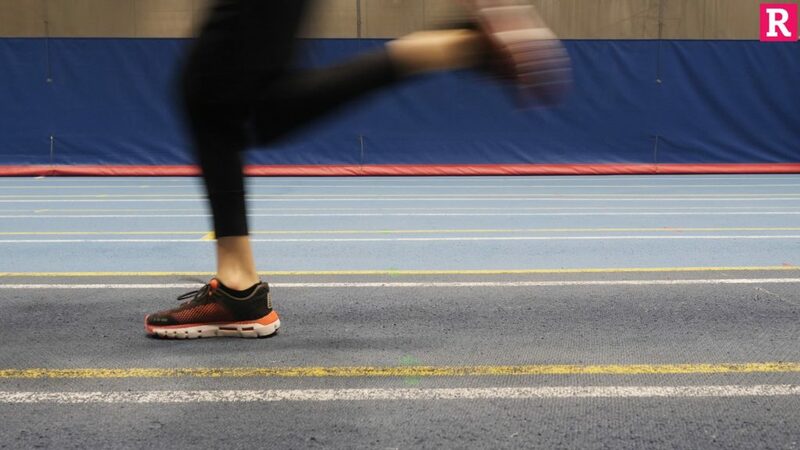 In each HOVR 2019 shoe there is a chip embedded in the right heel that can calculate pace, stride length and distance run and provide feedback on your training progress. This data is all connected and downloaded to your phone or watch through the Map My Run app. The feedback provided by the app is designed to help the runner improve. Best of all, if you prefer to run untethered from your smartphone, the chip in your shoe will sync with your phone as soon as you’re within reach. This shoe fit me a little smaller than most. I would recommend going up a half a size. If you’re used to a stiffer shoe when doing speedwork, I’d consider something like the Under Armour Velociti 2 for a slightly snappier ride, but if you’re a one-shoe-for-everything kind of person, the Infinite has you covered.